Abstract: Viral infections and pandemics result in millions of deaths worldwide each year. Viruses exploit host cellular processes, not only to gain entry and to deliver their genetic cargo, but also to counteract and use host immune defenses. To this end, a variety of ingenious strategies have evolved in viruses that involve fusion between virus and host membranes, channel formation through the host plasma membranes, disruption of the membrane vesicles, or a combination of these events. The entry and infection pathways of virus are thus largely defined by the interactions between virus particles and their cell surface and cytoplasmic receptors. A thorough analysis of virus–host interactomes may reveal novel mechanisms in virus entry, virus infection, and pathogenic strategies to modulate host metabolic pathways. The study of viral entry, infection, and pathogenesis has evolved over a long period. A host of next-generation technological advancements in this field has been discussed in this review. Viruses, obligate intracellular parasites, are metastable molecular assemblages that should be unlocked systematically during cellular entry by specific molecular and/or cellular environmental cues, with minimal energetic input.1 The transport of genetic material and other essential components through the host cell barriers requires, in most cases, precise attachment of the virions to the cell surface receptor(s) of the permissive host cells. Sometimes, viruses require additional co-receptor(s) on the host cell surface in order to complete successful entry within the cell. Therefore, the presence of cell receptors and co-receptors, where required, determines the fate of viral attachment and entry, especially in animal cells. Enzyme-based assays provided the initial clues concerning the chemical nature of cell surface components to which virions become attached. Early studies on identification of cell surface receptors depended on enzyme-based characterizations, such as in adenovirus and influenza virus.13,14 The development of technologies such as monoclonal antibody-mediated immunoprecipitation or affinity chromatography, expression of cell surface receptors in non-susceptible cells through gene transformation, and subsequent molecular cloning of cellular receptors from the transformed non-susceptible cells paved the way toward identification of myriad of cell surface receptors/co-receptors required for virus attachment (Table 1).15–17 These discoveries largely depended on the cloning of the receptor genes that allowed detailed mutagenesis analyses and structural studies on host–virus interactions. Abbreviations: EBV, Epstein–Barr virus; HSV-1/2, Herpes simplex virus 1/2; HCMV, human cytomegalovirus; KSHV, Kaposi’s sarcoma-associated herpesvirus; HH-8, human herpesvirus 8; VZV, varicella-zoster virus; EBOV, Ebola virus; NiV, Nipah virus; MeV, measles virus; RABV, rabies virus; SARS-CoV, severe acute respiratory syndrome-coronavirus; HAV, Hepatitis A virus; POV, poliovirus; EV71, enterovirus 71; CVB, coxsackievirus B; HRV14, human rhinovirus 14; HRV2, human rhinovirus 2; LASV, Lassa virus; LCMV, lymphocytic choriomeningitis mammarenavirus; JUNV, Junin mammarenavirus; SABV, Sabia mammarenavirus; ANDV, Andes virus; RVFV, Rift Valley fever virus; CHFV, Crimean-Congo hemorrhagic fever virus; JEV, Japanese encephalitis virus; HCV, hepatitis C virus; DENV, dengue virus; WNV, west Nile virus; HBV, hepatitis B virus; IAV, influenza A virus; HPV, human papillomavirus; JCV, John Cunningham virus; SV40, simian vacuolating virus 40; HIV-1, human immunodeficiency virus 1; HTLV-1, human T-cell leukemia virus 1; CHIKV, chikungunya virus; SINV, sindbis virus; SFV, Semliki Forest virus; CD4/21/35/46/81/155, clusters of differentiation 4/21/35/46/81/155; HLA-II, human leucocyte antigen-II; TNFRSF14, Tumor necrosis factor receptor superfamily, member 14; EphA2, ephrin receptor tyrosine kinase A2; M6P-R, mannose-6-phosphate receptor; IDE, insulin degrading enzyme; TIM-1, T-cell immunoglobulin and mucin domain 1; NPC-1, Niemann-Pick C 1; EFNB2/B3, ephrin B2/3; SLAM, signaling lymphocyte-activation molecule; nAChR, nicotinic acetylcholine receptor; NCAM, neural cell adhesion molecule; p75NTR, p75 neurotrophin receptor; ACE2, angiotensin 1 converting enzyme 2; DC-SIGN, dendritic cell-specific ICAM-3 grabbing non-integrin; DC-SIGNR, dendritic cell-specific ICAM-3 grabbing non-integrin receptor; L-SIGN, liver/lymph node-specific intracellular adhesion molecule-3 grabbing non-integrin; PSGL-1, P-selctin glycoprotein ligand 1; SCARB2, scavenger receptor class B, member 2; DAF, decay accelerating factor; CAR, coxsackievirus and adenovirus receptor; ICAM-1, intercellular adhesion molecule-1; VLDL-R, very low density lipoprotein receptor; HBGA, histo-blood group antigen; SRB-1, scavenger receptor class B, member 1; ASGPR, asialoglycoprotein receptor; NTCP, sodium taurocholate receptor; LSTc, sialyllacto-N-tetraose c; GM1, monosialotetrahexosylganglioside 1; Hsc70, heat shock cognate protein 70; GLUT-1, glucose transporter-1; PHB, prohibitin; nLc4Cer, neolactotetraosylceramide; 5-HT2, 5-hydroxytryptamine receptor 2; JAM-A, junctional adhesion molecule-A; CCR5, C-C chemokine receptor type 5; CXCR4, C-X-C chemokine receptor type 4; NRP-1, neuropilin-1. In order to model virus infection at the cellular level, we need exhaustive PPI data not only on intravirus–host interactomes but also on virus–host interactomes. Although far from complete, the studies discussed above have generated a huge primary database of intraviral and virus–host PPIs. These results are now being validated by detailed computational and bioinformatic analyses. Such PPI networks and their analyses may prove to be a powerful resource for the development of antiviral therapeutic strategies. 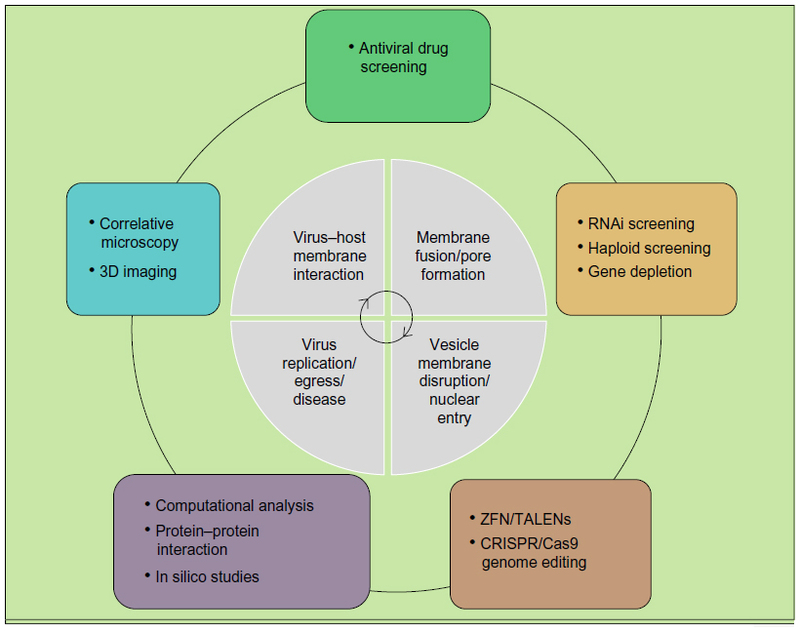 The study of virus attachment and entry entered a new era in the last decade with the development of a host of gene-disruption technologies.37 These new technologies include multiplex screenings of small molecule inhibitors, RNA interference (RNAi) screening, haploid screening and genome editing, host–virus interactomics, 3D imaging, and in silico approach (Figure 1). This review explores recent advances and discusses the potential novel applications in the study of virus entry and infection. Figure 1 Advanced tools in the study of host–virus interaction dynamics. Abbreviations: RNAi, RNA interference; ZFN, zinc-finger nuclease; TALENs, transcription activator-like effector nucleases; CRISPR, clustered regularly interspaced short palindromic repeat; Cas 9, CRISPR-associated 9. 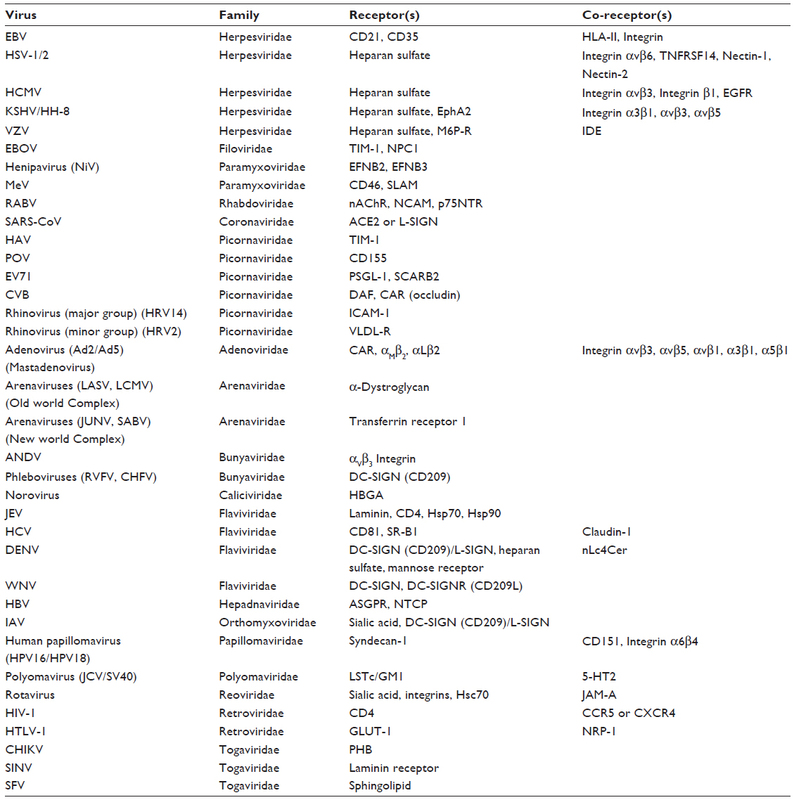 In vitro cytopathic effects-based high-throughput screening assays to identify novel antiviral drugs against bluetongue virus,44 influenza virus,45–47 SARS-CoV,48 yellow fever virus,49 and Crimean-Congo hemorrhagic fever virus50 have identified unique antivirals. In a novel modification of studying virus–host interactions, a systematic large number of pair-wise drug interactions were explored.51 This multiplex screening method (multiplex screen for interacting compounds) employed a combination of cell culture, immunostaining, fluorescence imaging, and bioinformatics tools and tested approximately 500,000 drug pairs that synergistically inhibited HIV replication in HeLa-based MAGI cells expressing CD4 receptor. The multiplex screen for interacting compounds screening methodology not only identified promising drug pairs but also identified novel targets for HIV therapies that inhibit viral assembly and release. New genetic engineering technologies that specifically target genome loci through DNA double-strand breaks (DSBs) can be classified into three novel platforms: zinc-finger nucleases (ZFNs), transcription activator-like effector nucleases (TALENs), and the most powerful clustered regularly interspaced short palindromic repeat (CRISPR)-associated 9 (Cas9) guided silencing.65–67 These new gene-depletion strategies can be used to target putative host cell proteins suspected to be involved in virus interactions. CRISPR loci evolved in bacteria and archaea as a part of adaptive immune system, which acquire foreign DNA resulting in the production of surveillance complexes consisting of short complementary guide RNAs (gRNAs) and an endonuclease (Cas9). When coexpressed in cells, gRNA and Cas9 can target DNA, namely, putative host-protein gene, for modification/silencing. The gRNAs contain a 20 base-pair guide sequence, which recruits the gRNA/Cas9 complex to its target sequence by base pairing. Successful binding of Cas9 to the target and subsequent endonuclease disruption requires the correct protospacer adjacent motif trinucleotide sequence immediately following the target sequence. Endonuclease Cas9 cuts both strands of DNA causing a DSB, which lies three to four nucleotides upstream of the protospacer adjacent motif sequence. The DSBs may be repaired by an error-prone non-homologous end joining (NHEJ) DNA repair mechanism, which often results in the generation of inserts/deletions at the DSB site. This may lead to disruption of open reading frames in the target genes. A review on the applications of CRISPR/Cas9 technology in human papillomaviruses (HPV16, HPV18; family Papillomaviridae), hepatitis B virus (family Hepadnaviridae), EBV (family Herpesviridae), and HIV-1 has recently been published.68 These powerful genome editing technologies are sure to delve into many host–virus interactome studies in future. Organisms impose multiple barriers to virus entry. However, viruses exploit fundamental cellular structures and processes to gain entry to cells, unpack their genetic cargo, and initiate productive replication. Viruses seem to target common and central host proteins for remodeling the cellular signaling pathways and machinery. Therefore, gaining knowledge on the functions of the individual viral proteins in the host cell and that on their interactions with cellular signaling pathways is of paramount importance in understanding the pathogenesis. Systems virology, a highly integrated interdisciplinary systems biology approach in virology, has been instrumental in the global understanding of hitherto unknown virus–host interactions and especially of the dynamic nature of host responses against viruses. The integration of high-throughput array-based genetic screening, computational systems biology, and in silico strategies has substantiated known interactions and unraveled new interactions between the virus and host proteins. Systems biology approaches may help to identify the impact of virulence factors on the host system based on computational models of signal transduction and pathway analysis. Advances in computational biology in molecular dynamics simulations are required to understand unique features of protein structures and the chain of events that ensue with the initial attachment and entry of virus. The completeness of virus–host PPIs will be cornerstone in the structure-based predictions of virus–host DDIs and virus-induced network perturbations in viral infections. The virus-centric approach in developing antiviral drugs might fail to produce desired effects due to the potential genetic plasticity of the viruses, whereas a host-protein-based approach may identify a broad-range of antiviral drug target candidates. There are already a number of approved drugs designed against human proteins; however, considering the multidimensional nature of PPIs, there is a long way to go before the development of low-risk and low-cost antivirals. The author apologizes to those experts whose valuable works could not be mentioned here due to space limitations. The author also acknowledges editorial help from Ms Sutanuka Chattaraj in preparing the manuscript. The author declares no conflicts of interest in this work. Marsh M, Helenius A. Virus entry: open sesame. Cell. 2006;124(4):729–740. Puck TT, Garen A, Cline J. The mechanism of virus attachment to host cells. The role of ions in the primary reaction. J Exp Med. 1951;93(1):65–88. Gilbert P-A, Kamen A, Bernier A, Garnier A. A simple macroscopic model for the diffusion and adsorption kinetics of r-Adenovirus. Biotechnol Bioeng. 2007;98:239–251. Lam V, Boehme KW, Compton T, Yin J. Spatial patterns of protein expression in focal infections of human cytomegalovirus. Biotechnol Bioeng. 2006;93(6):1029–1039. Haseltine EL, Lam V, Yin J, Rawlings JB. Image-guided modeling of virus growth and spread. Bull Math Biol. 2008;70(6):1730–1748. Fort J, Mendez V. Time-delayed spread of viruses in growing plaques. Phys Rev Lett. 2002;89(17):178101. Hofacre A, Wodarz D, Komarova NL, Fan H. Early infection and spread of a conditionally replicating adenovirus under conditions of plaque formation. Virol. 2012;423:89–96. Kielian M. Mechanisms of virus membrane fusion proteins. Ann Rev Virol. 2014;1:171–189. Mudhakir D, Harashima H. Learning from the viral journey: how to enter cells and how to overcome intracellular barriers to reach the nucleus. AAPS J. 2009;11(1):65–77. doi: 10.1208/s12248-009-9080-9. Kunz S. Receptor binding and cell entry of old world arenaviruses reveal novel aspects of virus–host interaction. Virology. 2009;387(2):245–249. Mercer J, Helenius A. Gulping rather than sipping: macropinocytosis as a way of virus entry. Curr Opin Microbiol. 2012;15:1–10. Fay N, Pante N. Old foes, new understandings: nuclear entry of small non-enveloped DNA viruses. Curr Opin Virol. 2015;12:59–65. Philipson L, Lonberg-Holm K, Pettersson U. Virus-receptor interaction in an adenovirus system. J Virol. 1968;2(10):1064–1075. Bergelson LD, Bukrinskaya AG, Prokazova NV, et al. Role of gangliosides in reception of influenza virus. Eur J Biochem. 1982;128(2–3):467–474. Flint SJ, Enquist LW, Racaniello VR, Skalka AM. Principles of Virology: Molecular Biology, Pathogenesis and Control of Animal Viruses. second ed. ASM Press; 2004. Grove J, Marsh M. The cell biology of receptor-mediated virus entry. J Cell Biol. 2011;195(7):1071–1082. viralzone.expasy.org [homepage on the Internet]. ViralZone. SIB, Swiss Institute of Bioinformatics. PMID:20947564. Available from http://viralzone.expasy.org/. Accessed November 23, 2015. Bhattacharjee S. Role of genomic and proteomic tools in the study of host–virus interactions and virus evolution. Ind J Virol. 2013;24(3):306–311. Maxwell KL, Frappier L. Viral proteomics. Microbiol Mol Biol Rev. 2007;71(2):398–411. Ma-Lauer Y, Lei J, Hilgenfeld R, von Brunn A. Virus–host interactomes- antiviral drug discovery. Curr Opin Virol. 2012;2:614–621. Uetz P, Giot L, Cagney G, et al. A comprehensive analysis of protein–protein interactions in Saccharomyces cerevisiae. Nature. 2000;403:623–627. Bailer SM, Haas J. Connecting viral with cellular interactomes. Curr Opin Microbiol. 2009;12:453–459. Barrios-Rodiles M, Brown KR, Ozdamar B, et al. Highthroughput mapping of a dynamic signaling network in mammalian cells. Science. 2005;307:1621–1625. Nyfeler B, Michnick SW, Hauri HP. Capturing protein interactions in the secretory pathway of living cells. Proc Natl Acad Sci U S A. 2005;102:6350–6355. Cassonnet P, Rolloy C, Neveu G, et al. Benchmarking a luciferase complementation assay for detecting protein complexes. Nat Methods. 2011;8:990–992. Chertova E, Chertov O, Coren LV, et al. Proteomic and biochemical analysis of purified human immunodeficiency virus type 1 produced from infected monocyte-derived macrophages. J Virol. 2006;80(18):9039–9052. Uetz P, Rajagopala SV, Dong YA, Haas J. From ORFeomes to protein interaction maps in viruses. Genome Res. 2004;14(10B):2029–2033. Flajolet M, Rotondo G, Daviet L, et al. A genomic approach of the hepatitis C virus generates a protein interaction map. Gene. 2000; 242(1–2):369–379. Calderwood MA, Venkatesan K, Xing L, et al. Epstein-Barr virus and virus human protein interaction maps. Proc Natl Acad Sci U S A. 2007;104:7606–7611. Uetz P, Dong YA, Zeretzke C, et al. Herpesviral protein networks and their interaction with the human proteome. Science. 2006;311(5758):239–242. Mairiang D, Zhang H, Sodja A, et al. Identification of new protein interactions between dengue fever virus and its hosts, human and mosquito. PLoS One. 2013;8(1):e53535. doi: 10.1371/journal.pone.0053535. de Chassey B, Meyniel-Schicklin L, Aublin-Gex A, Andre P, Vincent Lotteau V. New horizons for antiviral drug discovery from virus–host protein interaction networks. Curr Opin Virol. 2012;2:606–613. Bouraï M, Lucas-Hourani M, Gad HH, et al. Mapping of chikungunya virus interactions with host proteins identified nsp2 as a highly connected viral component. J Virol. 2012;86(6):3121–3134. Pfefferle S, Schöpf J, Kögl M, et al. The SARS-coronavirus–host interactome: identification of cyclophilins as target for pan-coronavirus inhibitors. PLoS Pathog. 2011;7(10):e1002331. Shaw ML. The host interactome of influenza virus presents new potential targets for antiviral drugs. Rev Med Virol. 2011;21:358–369. Jäger S, Cimermancic P, Gulbahce N, et al. Global landscape of HIV-human protein complexes. Nature. 2011;481:365–370. Kilcher S, Mercer J. Next generation approaches to study virus entry and infection. Curr Opin Virol. 2014;4:8–14. Webb JR, Lee SH, Vidal SM. Genetic control of innate immune responses against cytomegalovirus: MCMV meets its match. Genes Immun. 2002;3:250–262. Samuel CE. Host genetic variability and West Nile virus susceptibility. Proc Natl Acad Sci U S A. 2002;99:11555–11557. Welton AR, Chesler EJ, Sturkie C, Jackson AU, Hirsch GN, Spindler KR. Identification of quantitative trait loci for susceptibility to mouse adenovirus type 1. J Virol. 2005;79:11517–11522. Bottomly D, Ferris MT, Aicher LD, et al. Expression quantitative trait Loci for extreme host response to influenza a in precollaborative cross mice. G3 (Bethesda). 2012;2:213–221. Crozat K, Georgel P, Rutschmann S, et al. Analysis of the MCMV resistome by ENU mutagenesis. Mamm Genome. 2006;17:398–406. Won S, Eidenschenk C, Arnold CN, et al. Increased susceptibility to DNA virus infection in mice with a GCN2 mutation. J Virol. 2012;86:1802–1808. Li Q, Maddox C, Rasmussen L, Hobrath JV, White LE. Assay development and high throughput antiviral drug screening against bluetongue virus. Antiviral Res. 2009;83(3):267–273. Noah JW, Severson W, Noah DL, Rasmussen L, White EL, Jonsson CB. A cell-based luminescence assay is effective for high-throughput screening of potential influenza antivirals. Antiviral Res. 2007;73:50–59. Severson WE, McDowell M, Ananthan S, et al. High-throughput screening of a 100,000-compound library for inhibitors of influenza A virus (H3N2). J Biomol Screen. 2008;13:879–887. König R, Stertz S, Zhou Y, et al. Human host factors required for influenza virus replication. Nature. 2010;463:813–817. Severson WE, Shindo N, Sosa M, et al. Development and validation of a high-throughput screen for inhibitors of SARS CoV and its application in screening of a 100,000-compound library. J Biomol Screen. 2007;12:33–40. Gong E, Ivens T, van den Eynde C, Hallenberger S, Hertogs K. Development of robust antiviral assays for profiling compounds against a panel of positive-strand RNA viruses using ATP/luminescence readout. J Virol Methods. 2008;151:121–125. Paragas J, Whitehouse CA, Endy TP, Bray M. A simple assay for determining antiviral activity against Crimean-Congo hemorrhagic fever virus. Antiviral Res. 2004;62:21–25. Tan X, Hu L, Luquette LJ 3rd, et al. Systematic identification of synergistic drug pairs targeting HIV. Nat Biotechnol. 2012;30(11):1125–1130. Fire A, Xu S, Montgomery MK, Kostas SA, Driver SE, Mello CC. Potent and specific genetic interference by double-stranded RNA in Caenorhabditis elegans. Nature. 1998;391:806–811. Timmons L, Fire A. Specific interference by ingested dsRNA. Nature. 1998;395:854. Karlas A, Machuy N, Shin Y, et al. Genome-wide RNAi screen identifies human host factors crucial for influenza virus replication. Nature. 2010;463:818–822. Brass AL, Dykxhoorn DM, Benita Y, et al. Identification of host proteins required for HIV infection through a functional genomic screen. Science. 2008;319:921–926. König R, Zhou Y, Elleder D, et al. Global analysis of host–pathogen interactions that regulate early-stage HIV-1 replication. Cell. 2008;135:49–60. Zhou H, Xu M, Huang Q, et al. Genome-scale RNAi screen for host factors required for HIV replication. Cell Host Microbe. 2008;4:495–504. Li Q, Brass AL, Ng A, et al. A genome-wide genetic screen for host factors required for hepatitis C virus propagation. Proc Natl Acad Sci U S A. 2009;106(38):16410–16415. Tai AW, Benita Y, Peng LF, et al. A functional genomic screen identifies cellular cofactors of hepatitis C virus replication. Cell Host Microbe. 2009;5:298–307. Amberkar S, Kiani NA, Bartenschlager R, Alvisi G, Kaderali L. High-throughput RNA interference screens integrative analysis: towards a comprehensive understanding of the virus-host interplay. World J Virol. 2013;2(2):18–31. Carette JE, Guimaraes CP, Varadarajan M, et al. Haploid genetic screens in human cells identify host factors used by pathogens. Science. 2009;326(5957):1231–1235. Carette JE, Raaben M, Wong AC, et al. Ebola virus entry requires the cholesterol transporter Niemann–Pick C1. Nature. 2011;477:340–343. Jae LT, Raaben M, Riemersma M, et al. Deciphering the glycosylome of dystroglycanopathies using haploid screens for lassa virus entry. Science. 2013;340(6131):479–483. Petersen J, Drake MJ, Bruce EA, et al. The major cellular sterol regulatory pathway is required for andes virus infection. PLoS Pathog. 2014;10(2):e1003911. Carroll D. Genome engineering with zinc-finger nucleases. Genetics. 2011;188:773–782. Miller JC, Tan S, Qiao G, et al. A TALE nuclease architecture for efficient genome editing. Nat Biotechnol. 2011;29:143–148. Wiedenheft B, Sternberg SH, Doudna JA. RNA-guided genetic silencing systems in bacteria and archaea. Nature. 2012;482:331–338. White MK, Hu W, Khalili K. The CRISPR/Cas9 genome editing methodology as a weapon against human viruses. Discov Med. 2015;19(105):255–262. Sprinzak E, Margalit H. Correlated sequence-signatures as markers of protein–protein interaction. J Mol Biol. 2001;311:681–692. Dyer MD, Murali TM, Sobral BW. Computational prediction of host–pathogen protein–protein interactions. Bioinformatics. 2007;23(13):I159–I166. Dyer MD, Murali TM, Sobral BW. The landscape of human proteins interacting with viruses and other pathogens. PLoS Pathog. 2008; 4(2):e32. Tastan O, Qi Y, Carbonell JG, Klein-Seetharaman J. Prediction of interactions between HIV-1 and human proteins by information integration. Pac Symp Biocomput. 2009:516–527. Zheng L-L, Li C, Ping J, Zhou Y, Li Y, Hao P. The domain landscape of virus–host interactomes. BioMed Res Int. 2014;2014:13. Article ID 867235. Navratil V, de Chassey B, Combe CR, Lotteau V. When the human viral infectome and diseasome networks collide: towards a systems biology platform for the aetiology of human diseases. BMC Systems Biol. 2011;5:13. Basharat Z, Yasmin A. In silico assessment of phosphorylation and O-b-GlcNAcylation sites in human NPC1 protein critical for Ebola virus entry. Infect Genet Evol. 2015;34:326–338. Veljkovic V, Glisic S, Muller CP, et al. In silico analysis suggests interaction between Ebola virus and the extracellular matrix. Front Microbiol. 2015;6:135. Navratil V, de Chassey B, Meyniel L, et al. VirHostNet: a knowledge base for the management and the analysis of proteome-wide virus–host interaction networks. Nucleic Acids Res. 2009;37:D661–D668. Chatr-aryamontri A, Ceol A, Peluso D, et al. VirusMINT: a viral protein interaction database. Nucleic Acids Res. 2009;37:D669–D673. Meyniel-Schicklin L, de Chassey B, Andre P, Lotteau V. Viruses and interactomes in translation. Mol Cell Proteomics. 2012;11: M111014738. Lakadamyali M, Rust MJ, Babcock HP, Xiaowei Zhuang X. Visualizing infection of individual influenza viruses. Proc Natl Acad Sci U S A. 2003;100(16):9280–9285. Cristea IM, Carroll J-WN, Rout MP, Rice CM, Chait BT, MacDonald MR. Tracking and elucidating Alphavirus-Host protein interactions. J Biol Chem. 2006;281(40):30269–30278. Chojnacki J, Muller B. Investigation of HIV-1 assembly and release using modern fluorescence imaging techniques. Traffic. 2013;14:15–24. Risco C, de Castro IF, Sanz-Sanchez L, Narayan K, Grandinetti G, Sriram Subramaniam S. Three-dimensional imaging of viral infections. Ann Rev Virol. 2014;1:453–473.